The administrators, faculty and staff are very proud of all our students, especially for their research accomplishments. The School of Science would like to acknowledge those students who have distinguished themselves and our university with their achievements. Students from the Hicks and Ouellet Labs traveled to the University of Albany for the 5th Annual RNA Symposium and were able to present their research alongside RNA biologists in similar fields of research. Representing Monmouth University at the conference were Kevin Gallagher, Koushik Muralidharan, Sarah Falotico, Nicole Sivetz, Brian Reiss, Artiom Efimenko, Jonathan Shen, Darrel D’Souza, Dr. Martin Hicks and Dr. Jonathan Ouellet. Monmouth University students from the labs of Dr. Martin Hicks and Dr. Jonathan Ouellet were awarded top prizes at the ICFNJ Symposium! 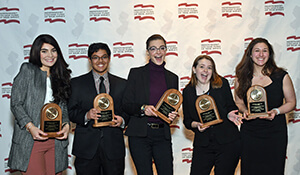 Scored in seven areas of scholarship and research, including overall presentation, the top five scorers of the ICFNJ Undergraduate Research Program included two Monmouth University stand out students: 2nd highest scorer – Nicole Sivetz and 3rd highest scorer – Koushik Muralidharan. 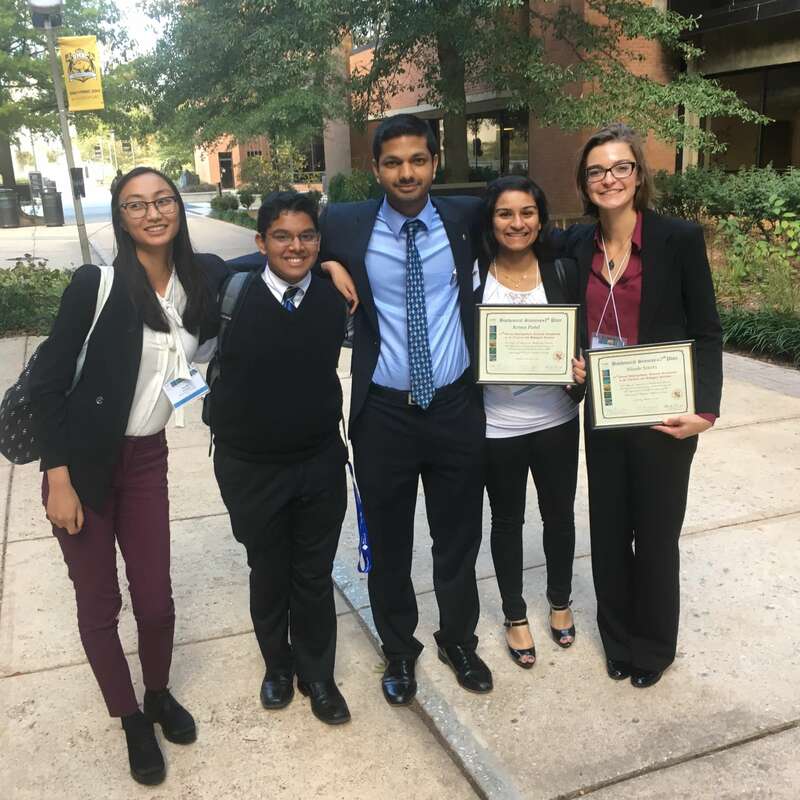 Four Monmouth University students, representing the labs of Dr. Jonathan Ouellet (Chemistry and Physics Department) and Dr. Martin Hicks (Biology Department) were awarded First Prizes in each of their judged cohorts in the biological sciences at the 20th Undergraduate Research Symposium at the University of Maryland, Baltimore County on Saturday, October 14, 2017. 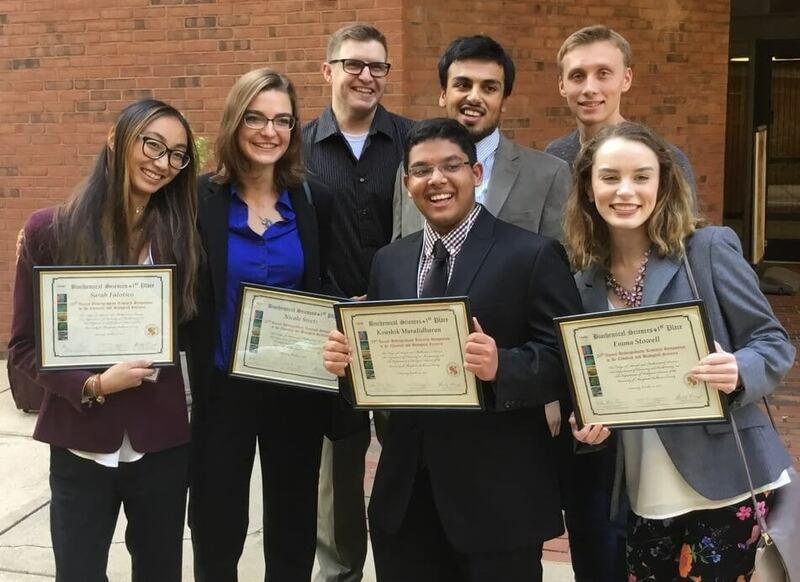 Earning First Prize honors were Sarah Falotico (1st Place, Hicks Lab), Nicole Sivetz (1st Place, Hicks Lab), Kousik Muralidharan (1st Place, Hicks Lab), and Emma Stowell (1st Place, Ouellet Lab), pictured here, left to right in the front row. To win First Prize, the student investigator must communicate well and score high in four categories: research background and hypothesis, methodology, results and conclusions. Congratulations to these talented Monmouth University student researchers and their dedicated faculty mentors! Congratulations to members of the Dr. Jonathan Ouellet (Chemistry) and Dr. Martin Hicks (Biology) Labs who presented at the 19th Undergraduate Research Symposium in the Chemical and Biological Sciences at the University of Maryland, Baltimore County on October 22, 2016. Chemistry major Krima Patel won 1st Prize and Biology major Nicole Sivetz won 2nd Prize for their posters in the Biochemical Sciences. Biology majors Sarah Falotico and Sachin Parikh also presented posters at this symposium. All MU faculty members are committed to excellence in teaching, scholarship, leadership and service. We would like to acknowledge faculty members who have been recognized for distinguishing themselves in their fields. 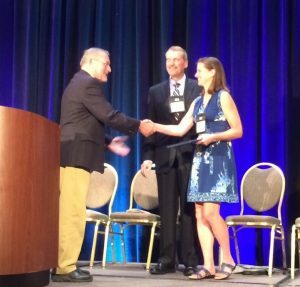 Congratulations to Associate Professor of Mathematics Susan Marshall, Ph.D. for being awarded both the Carl B. Allendoerfer Award and the Paul R. Halmos – Lester R. Ford Award by the Mathematical Association of America. Read about Dr. Marshall’s Work.